It may be spring now, but in some parts of the country, it still feels like winter. When it’s cold, the body craves warm foods. Adding soups to your diet provides warmth when it is absolutely freezing outdoors. I’m not talking about canned soups. There is nothing better than homemade soup. When you think creamy soup in general, you think that it is loaded with cream and calories. However, there are healthy creamy soup recipes that are basically warmed and blended vegetables. When soup contains plenty of nutrient-dense vegetables, herbs, and spices, you are likely consuming something delicious and healthy. At the same time, you are cutting calories without sacrificing any flavor. Consider blending ingredients like chickpeas, cauliflower, or butternut squash to create a creamy and tasty soup recipe. The following are five homemade and healthy creamy soup recipes that will keep you cozy and satisfied through the seasonal change. Chickpeas are perfect for a blended creamy soup, and are packed with protein to give you energy. They are also an excellent source of nutrients like manganese, molybdenum, folate, and fiber. This blended chickpea soup recipe is easy, and will make six to eight servings. As a result, it is great for big families looking to eat healthy. In a large pot, heat coconut oil over medium heat, then add carrots, celery, and onions. Stir occasionally for 10 minutes until tender. Transfer vegetables to a high-speed blender or food processor, and add garlic, chickpeas, green onions, parsley, dried herbs, lemon juice and zest, and vegetable stock. Process until smooth, but add more vegetable stock if you want a thinner soup. Return the creamy soup to the pot, and season with pepper and sea salt. Serve with drizzled extra-virgin olive oil. Cauliflower is the perfect ingredient to create a creamy soup recipe without the cream. Cauliflower provides a ton of detoxifying nutrients that are important for the immune system, especially omega-3, magnesium, fiber, vitamin C, and B vitamins. The following cauliflower recipe is easy to make, and it won’t use up too much of your time either. The creamy soup recipe will make eight cups of soup. Place the cauliflower, onions, leek, and broth in a large soup pot, and bring to a boil. Reduce the heat, and simmer until the cauliflower is soft, for about eight minutes. Transfer the mixture to a blender and add coconut milk, hemp or cashews, ginger, garlic, salt, and lemon juice if using. Blend on high speed until it is smooth. Be careful to hold down the blender lid, as the hot soup will expand and may pop off the lid. Serve with some hemp heart if desired. The soup keeps for five days in the freezer, and also freezes well. Butternut squash is a type of winter squash. It is extremely nutrient-rich and perfect for healthy creamy soup recipes. Winter squash, in general, is an excellent source of vitamin A, vitamin C, potassium, manganese, folate, and fiber. The following recipe is so rich and creamy, that you definitely won’t miss the dairy! The recipe will yield four to six servings. Peel and chop the butternut squash. Toss the squash in one tablespoon of duck fat, ghee, or oil. Roast in a baking dish for about 40 minutes, or until tender. As the squash roasts, in a large pot or skillet sauté the onions and rest of the duck fat until the onions begin to brown on the edges. Add the garlic to the skillet, as well as the salt, sage, and pepper. Cook for about two minutes and add the broth, coconut milk, and water. Add the roasted squash, and stir together. Add the orange juice just before turning off the heat. After the soup has cooled for a bit, pour it into a blender until it is smooth. Be sure not to fill it to the top because the steam will expand the liquid. Put the soup in bowls. In a small skillet, fry fresh sage in one to two tablespoons of ghee or duck fat, until it is crispy to the touch. Garnish each soup with a couple of sage leaves. What is blended soup without sweet potato and carrots? 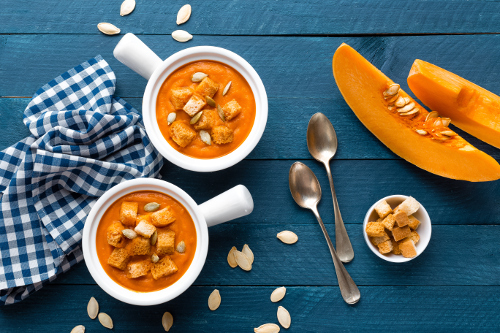 Creamy carrot and sweet potato soup is perfect for the cooler months. The following creamy soup recipe is warm and spicy, but also not overpowering in its flavor. It’s also spiced with ginger, garlic, and cayenne pepper. The creamy carrot and sweet potato recipe will serve about four people. In a large pot, melt the coconut oil over medium heat, and add garlic, onion, and ginger. Saute for five to six minutes, or until the onion is translucent. Stir in the curry paste. In a small bowl, whisk together some broth with the almond butter until it is smooth. Add the mixture to the pot, along with the remaining broth, sweet potatoes, carrots, salt, and cayenne, and stir until combined. Bring the soup to a low boil over medium-high heat, and then reduce to medium-low heat. Cover and simmer for 15 to 20 minutes, or until the carrots or potatoes are tender. Carefully ladle the soup to a blender. Depending the size of the blender, you will likely have to do a couple batches. Also, have the blender lid slightly ajar to allow steam to escape. Blend on low speed, and slowly increase the speed until the soup is complexly soup. Return the soup to the pot, and season with pepper and salt. If the soup is too thick you can add a bit more broth if you like. Reheat the soup if necessary. Ladle the soup into bowls. If you like, top with toasted almonds, minced cilantro, and some lime juice. The soup will freeze well, or keep in the fridge for up to a week. Potatoes often get a bad reputation. As long as you avoid them in the form of potato chips and French fries, they can actually be very healthy. Potatoes contain vitamin C, vitamin B6, potassium, and fiber. They also combine well with leek to form a deliciously creamy potato leek soup. The following healthy creamy soup recipe will serve up to four people, and will likely take about an hour to make. Combine leeks, parsnip, potatoes, garlic, thyme, oregano, rosemary, and broth in a large pot. Bring ingredients to a boil. Reduce heat and simmer for about 45 minutes, until all the ingredients are tender. Remove from the heat and let it cool for about five minutes. In a blender, combine all ingredients until there are no lumps, and return soup to the stove. Add more liquid as needed. Toss in kale, and let it wilt. Remove from heat, and serve immediately. Creamy soup is great throughout this time of year. It is perfect for easing you out of winter depression, a flu, or a cold. Soup is very warming, and therefore, it’s a sure-fire way to prevent or treat an illness. Also, it’s a good idea to make a couple types of creamy soups for your weekly prep. Store them in large Mason jars, and have them for lunches or dinners for your week. Liddon, A., Oh She Glows Every Day: Quick and Simply Satisfying Plant-Based Recipes (Toronto: Penguin Canada Books Inc., 2016), 141. McCarthy, J., Joyous Detox: Your Complete Plan and Cookbook to Be Vibrant Every Day (Toronto: Penguin Group, 2016), 161. Sanfilippo, D., Practical Paleo: A Customized Approach to Health and a Whole Foods Lifestyle (USA: Victory Belt Publishing Inc., 2012), 348. Daniluk, J., “Hot Detox: A 21-Day Anti-Inflammatory Program to Heal Your Gut and Cleanse Your Body (Toronto: HarperCollins Publishers Ltd., 2016), 197. “Creamy Cauliflower Soup (with no cream),” Whole Approach, May 29, 2014; http://forum.wholeapproach.com/topic/creamy-cauliflower-soup-with-no-cream, last accessed February 13, 2017. Bruner, S., “Leek, Potato and Parsnip Soup,” Sondi Bruner, November 28, 2010; http://www.sondibruner.com/2010/11/28/leek-potato-and-parsnip-soup/.